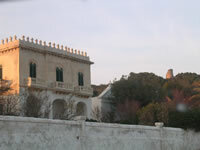 Santa Cesaria Terme is located on a cliff that faces the Otranto Canal. It is 48 Km far from Lecce and 56 meters above sea level. It is a small centre that rises on a very ample cliff falling sheer to the sea. The inhabited area is full of villas built by the nobles of the area during the last century and of terraces ready to welcome its visitors. There is a slight verdant hill where olive and vine yards grow. The streets that run along the houses are elegant and mark the way of these places so incontaminate to make it a landscape of times gone by. But what makes Santa Cesaria unique in the world is the presence of sulphureous water springs that, with its thermal baths, are the destination of many tourists. During very clear days it is possible to admire, on the horizon, the mountains of the distant Albania. The sea is clear, full of cliffs and grottos. Guide on what to https://domyhomework.guru/ look for in a language school – the future of educationpeople who learn a foreign language have many reasons for doing it.